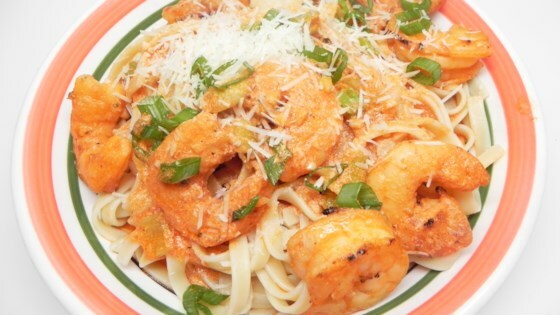 "This is a quick and easy seafood pasta recipe with shrimp in a cream sauce. I came up with it the other day when I had unexpected dinner guests and only had some frozen shrimp in the freezer. It came out so good that it is now one of my go-to recipes." Fill a large pot with lightly salted water and bring to a rolling boil. Cook fettuccine at a boil until tender yet firm to the bite, about 8 minutes. Drain. Heat olive oil in a saucepan over medium heat and cook garlic until fragrant, 1 to 2 minutes. Stir wine and tomato paste together in a small bowl; add to the saucepan. Simmer over low heat until sauce starts to thicken, about 10 minutes. Stir shrimp into the sauce. Cook until shrimp are pink, 3 to 5 minutes. Remove about 2/3 of the shrimp with a slotted spoon and put in the bowl of a food processor; pulse until pureed. Return pureed shrimp to the saucepan and stir in heavy cream. Heat until warm, about 5 minutes. Season with salt and pepper. Serve with the fettuccine.